The weird, (somewhat) chummy fiction of W.H. 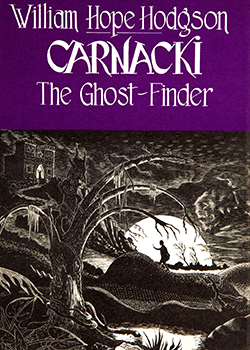 Hodgson’s Carnacki: The Ghost Finder. When I was a kid, one of my greatest pleasures was staying up super late, when I thought everyone else was long in bed, reading Three Investigators books and getting spooked out of my mind in this easy-going, chummy kind of way. It was like I was in the company of good friends, and we were all in for some scares that we knew, collectively, we’d see our way through. I’d bargain with myself, saying, “okay, one more chapter, and then we really need to get to bed,” and on I’d read until two, three in the morning, always adding yet another chapter to my ongoing haggling until at last I gave in when I thought the sun was all set to find me out.